Upper extremity lymphoedema after axillary node dissection is an iatrogenic disease particularly associated with treatment for breast or skin cancer. Anatomical studies and lymphangiography in healthy subjects identiﬁed that axillary node dissection removes a segment of the lymphatic drainage pathway running from the upper limb to the sub-clavicular vein, creating a surgical break. It is reasonable to infer that diﬀerent patterns of lymphatic drainage may occur in the upper limb following surgery and contribute to the various presentations of lymphoedema from none to severe. Firstly, were viewed animal imaging studies that investigated the repair of lymphatic drainage pathways from the limb after lymph node dissection. Secondly, we examined clinical imaging studies of lymphatic drainage pathways after axillary node dissection, including lymphangiography, lymphoscintigraphy and indocyanine green ﬂuorescence lymphography. Finally, based on the gathered data, we devised a set of general principles for the restoration of lymphatic pathways after surgery. Lymphoscintigraphy shows that restoration of the original lymphatic pathway to the axilla after its initial disruption by nodal dissection was not uncommon and may prevent lymphoedema. We found that regenerated lymphatic vessels and dermal backﬂow (the reﬂux of lymph to the skin) contributed to either restoration of the original pathway or rerouting of the lymphatic pathway to other regional nodes. Variation in the lymphatic drainage pathway and the mechanisms of ﬂuid drainage itself are the foundation of new lymphatic drainage patterns considered to be signiﬁcant in determining the severity with which lymphoedema develops. Dermal backﬂow occurred when the superﬁcial lymphatic vessels were obstructed and the radio-contrast media reﬂuxed from the lymphatic vessels to the lymphatic capillaries in the skin. Dermal backﬂow is one of the diagnostic imaging criteria for lymphatic congestion and is observed speciﬁcally in lymphoedematous limbs. Dermal backﬂow formed a bridge between the blocked lymphatic vessels and the patent lymphatic vessels and contributed to the formation of collateral pathways. Studies suggest that lymphatic drainage along the original route to the ipsilateral axillary nodes was re-established in most cases. For patients with lymphoedema, dermal backﬂow was present over the obstructed lymphatic vessels and extended to connect to patent lymphatic vessels. Tashiro and at el. identiﬁed collateral pathways to the supraclavicular lymph node in breast cancer patients after axillary node dissection. The authors of this papers clinical experience has revealed that ICG lymphography is useful for imaging assessment of BCRL by revealing lymphatic drainage pathways and the mechanisms of lymphatic ﬂuid drainage, either lymphatic vessels or dermal backﬂow. The axillary nodes, which are involved dominantly with the lymph drainage from the upper extremity, are lateral (brachial), central and apical nodes usually referred to as level 1 to 3 respectively in oncology. The lateral nodes in the axilla are where the axillary lymphatic cascade in the upper limb starts. There are two optional pathways that may bypass the lateral lymph nodes. The lateral lymphatic pathway runs along the cephalic vein and connects directly to the supraclavicular node. A part of the medial lymphatic vessel occasionally passes the supratrochlear node at the elbow, merges with the deep lymphatic vessel along the brachial artery and connects to the central lymph nodes in the axilla. These pathways may work as collateral drainage pathways when the medial pathway is interrupted, or the lateral axillary nodes only are removed, as in a level 1 dissection. It is reasonable to consider that the lymphatics may also regenerate themselves for patients with breast cancer after axillary node dissection. Lymphoscintigraphy revealed hot nodes in the axilla in more than half the cases and lymphangiography demonstrated that the lymphatic channels in the aﬀected limb could reconnect to residual axillary nodes. The lymphatic system must possess the capability to regenerate itself by ﬁlling the surgical break and repairing the original drainage pathway to the ipsilateral axilla. When patients underwent an axillary node dissection, lymphatic vessels were aﬀected not only in the upper limb, but also in the ipsilateral anterior chest, because the axillary nodes are the dominant lymphatic basin in the whole forequarter region. The mechanism of lymph ﬂuid drainage is an additional factor in determining the degree of lymphoedema. In this review, three types of rerouting were identiﬁed that enabled the aﬀerent lymph vessels of the removed lymph nodes to connect to the other regional lymph nodes, via either the regenerated lymphatic vessels or dermal backﬂow, or a combination. The lymphatic capillaries contributing to the dermal backﬂow are smaller than the lymphatic vessel and lymphoedema may manifest itself more severely if the dermal backﬂow interferes with the constructed drainage pathway. The variety of postoperative lymphatic pathways from the aﬀected upper limb is summarised from the reviewed data and illustrated schematically in Fig. 6 below which is taken from this article. Fig. 6. Schematic diagram in the forequarter representing the lymphatic pathway variation from the upper extremity after axillary node dissection as summarised from the reviewed data. Flow direction is indicated in black. The normal lymphatics in the upper limb drain to the supraclavicular lymph nodes (red)and the axillary lymph nodes (yellow) as a control (A). 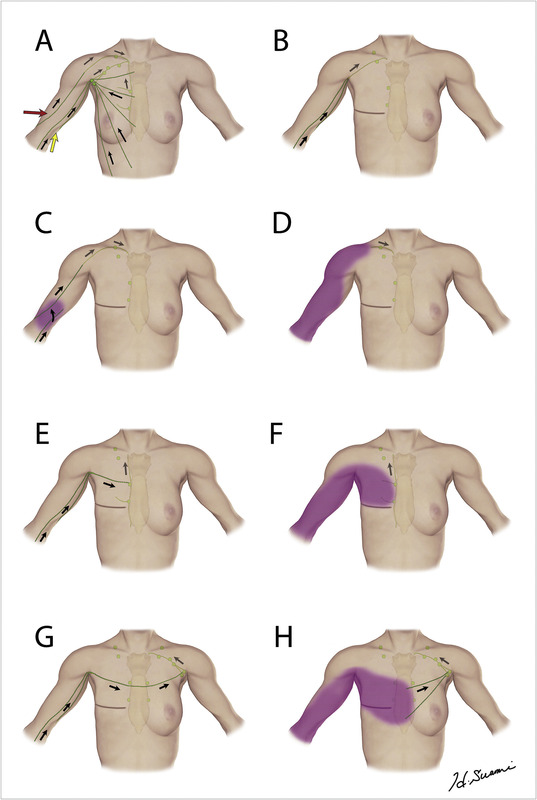 The drainage pathways are to the ipsilateral axillary (B), supraclavicular (C,D), internal mammary (E,F), and contralateral axillary nodes (G,H). Lymph ﬂuid could be carried by regenerated lymphatic vessels (B,E,G), the lateral pathway (C) or dermal backﬂow (D,F,H). Regeneration of lymphatics with repair of the original pathway to the axilla was not uncommon after an axillary dissection and this may contribute to the prevention of lymphoedema. Various collateral drainage pathways were identiﬁed using lymphangiography and ICG ﬂuorescence lymphography. Three types of rerouting were identiﬁed, one via regenerated lymphatic vessels, the other via dermal backﬂow or both mechanisms. Diﬀerent drainage pathways and the drainage mechanisms themselves are signiﬁcant factors in predicting the severity of lymphoedema after an axillary dissection.